During Memorial Day weekend we visited Shore Acres State Park, the Umpqua Lighthouse, Sunset Beach, and Heceta Head Lighthouse Scenic Viewpoint. I’ve visited Shore Acres on a few occasions and always enjoy photographing the flowers. There are several gardens to wander through and a trail to Simpson Beach. Another trail leads to the estate’s former tennis court located on a sandy, rocky cliff overlooking the ocean. We found tadpoles in the fresh water that must have been left by all the rain we’ve had. Amber and I enjoyed the very informative tour and museum at the Umpqua Lighthouse that is a current US Coast Guard station. It’s also the only lighthouse in Oregon that visitors may climb up into the light to view the beautiful prisms. 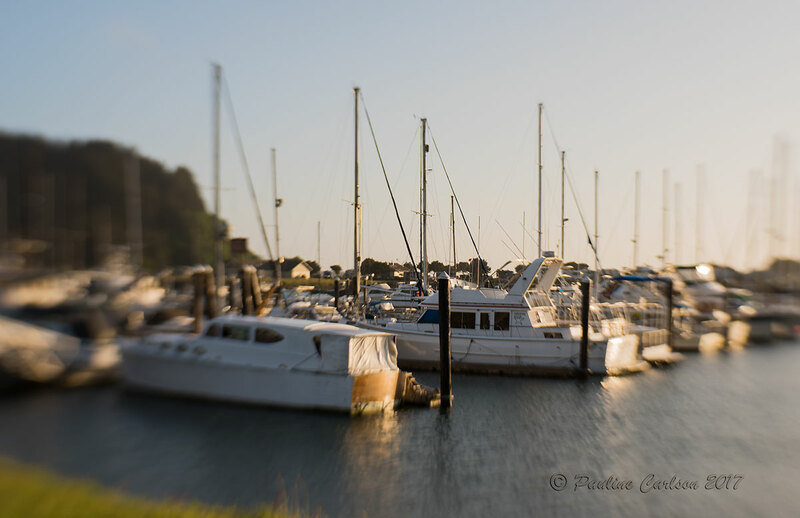 I spent some time experimenting with the Lensbaby Composer Pro with the Sweet 35 optic and Breakthrough Photography’s X4 10 stop neutral density filter. I’ll have to go back to the beach to get some more experience and take their tutorials with me. The neutral density filter could be addicting! Entrance to Tugman State Park. This year Amber and I decided to go camping at a park we had never been to for Memorial Day weekend and ultimately chose Tugman State Park. Reservations were made in January, but neither of us can remember why we chose this park, except that it has a lake and maybe we thought we would go kayaking there. I believed the campground was near the beach; it’s not. Driving is necessary if a beach outing is in the plans. In any case the park is very small and was quiet. It was easy backing the 5th wheel into our very spacious site. And as with all Oregon State parks, the campground is clean and well maintained. The only drawback is the proximity to highway 101. However, it wasn’t too bad as most of the time we blocked out the noise. We had a wonderful weekend exploring Coos Bay and the surrounding areas in more depth than we have in the past when we only had time to make short stops on our way to other destinations. Sailboats on the bay using a Lensbaby. Thursday I decided to use only the Lensbaby Composer Pro with the Sweet 35 optic. I’ve had the lens for a few years, but was frustrated with it so never used it much. I watched a couple videos before going camping and decided it was time to figure it out. Actually I came away with some great images. I took photos at Shore Acres State Park and Sunset Beach as well as the one above of the sailboats at Winchester Bay. Next time I get to take sailboat photos I’ll try a smaller aperture. Sea Lions at Simpson Reef on the Oregon Coast. I visited Simpson Reef on Friday, but the weather was overcast and the sea lions weren’t visible. Amber and I went back the next day and were able to observe hundreds or thousands of them. They are a ways back, so binoculars are needed. Last summer before visiting the Tetons I bought Zeiss Terra ED 10 x 42 binoculars at Cabela’s. Those were greatly appreciated many times and were perfect for watching the sea lions as well. While in the Tetons I realized I didn’t have the right lens to get photos of the wildlife, and I was drooling over the lenses I saw other visitors using. One very nice gentleman from England let me hold and try out his long lens. When I arrived home I did some research and found some affordable consumer zoom lenses. It didn’t take me long to purchase the Sigma 150-600mm lens! The lens is perfect for catching sea lions! I believe Nikon, Canon and Tamron also make this or a similar lens. As I was zooming in to edit the third photo I noticed one of the sea lions was branded with a number. So I did some research and found that some animals are being branded to be studied and eventually to prevent some of them from consuming the salmon that are swimming upstream. You can read more about this at OPB and at The Spokesman Review. When I went to pick up Amber on Friday afternoon hundreds of elk were grazing at the Dean Creek Elk Viewing Area! Another opportunity to practice using my 150-600mm lens! The elk were just gorgeous in the setting sun. The Hinsdale Interpretive Center is also located at the viewing area and provides several educational plaques about the elk and other wildlife in the area. Amber and I spent a morning exploring Coos Bay. While there we shopped in antique stores looking for items that could be used in a cupcakes and cookies photo shoot we want to do with the children at Little Pandas Playschool. We found a cute hand cranked beater for mixing whipped cream and cake batters. I’m pretty sure my grandmother owned these when I was growing up. Then one of the stores was selling the same desk used at my first elementary school. I had to keep reminding Amber that if the store was selling something I’ve used in my lifetime, it’s not an antique! It might be vintage, but certainly not antique. We ate butter clams and fish for lunch, from the Fisherman’s Seafood Market, on the boardwalk. I highly recommend stopping in for a meal. After lunch we explored the tugboat display on the boardwalk and took pictures of the sailboats captured with my favorite lens; the Sigma 35 Art. Over the weekend Amber and I also visited Shore Acres State Park, Sunset Beach, the Umpqua Lighthouse and the beach near Heceta Head Lighthouse. However, those images will have to wait for another post.